This 2 day Heights Rescue Training covers the additional training you are required to do under legislation ensuring your workers are trained and skilled in Heights Rescue and First Aid. Our heights rescue training course has been constructed from collaboration of experiences across a variety of industries including rope access, mining, gas, telecommunications, tower work, construction, wind farms, emergency services and military. 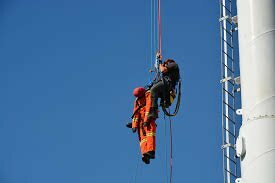 This heights rescue course is designed to teach workers and employers with no prior experience in rescue or first aid the skills, knowledge and requirements by law when workers are at height which includes first aid and a rescue plan. If a person conducting a business or undertaking provides a fall arrest system as a control measure. The person must establish emergency procedures, including rescue procedures, in relation to the use of the fall arrest system. The person must ensure that the emergency procedures are tested so that they are effective. The person must provide relevant workers with suitable and adequate information, training and instruction in relation to the emergency procedures. We’ll show you different techniques, equipment, plans and most of all you’ll leave confident that you can SAVE A LIFE! This is a physical course, you will sweat!! Make sure you or your workers are physically able before booking this course. Note: Facility only available Monday – Friday.